I’m not a review blogger and I don’t want to become one. I do, however, love to try new things and I love driving new cars. The cars will stay here, on the blog. But I’ve been meaning to tell y’all about my treadmill desk for ages and I can’t bring myself to write a blog post about how my treadmill desk changed my life (and it did). I have a dilemma. I find great things (most of them under $20) and I’m a sharer, an oversharer but a blog full of the crap I buy would be somewhere between boring and annoying. So I’ve made a decision. I will send out a weekly(ish) newsletter about the things I love and that you might love too. Don’t worry it’ll be short. A few things, maybe even just one, with a picture and a sentence or two but not much more than that. It will also be things that I bought or coveted and you won’t find any product placement or PR pitches in it. It’s just me, doing my thing. Like we used to before blogging became a business and businesses became content creators for bloggers. 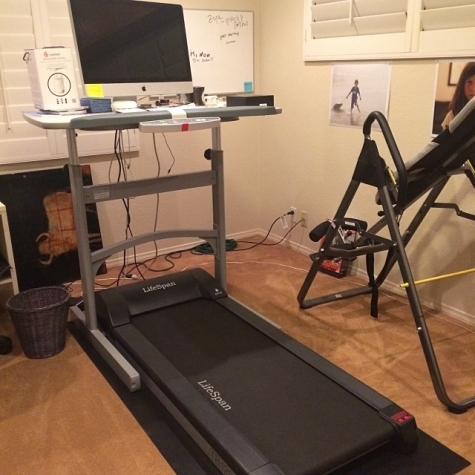 Last August I bought myself a treadmill desk & it changed my life. I now work more efficiently, my back is never stiff and I seldom daydream. You won’t lose weight on a treadmill desk if you’re writing because you’re not so much walking as you are shifting your weight. I suppose if you used to to watch TV and whatnot you’d move quite a bit more and possibly burn some real calories but I don’t have any experience with that. The desk is large and it’s ugly and it’s a lot more plastic than I enjoy having around but the benefit of not sitting for hours a day is monumental. I spent about $1800 and that included delivery and installation from Busy Body. I have a TR1200 and I see it’s now listed at $999. There are newer models but I feel no need to upgrade. If you think you’d like an email like this one once a week or so please sign up for it here. This way I can keep the blog focused on important things like one eyed dogs, teenage kids, travel, cars and navel gazing. I enjoy the exercise, and have an indoor treadmill is a very good thing. I’m trying to buy one. hope to own one soon.